When it comes to wedding day weather, it’s rain that makes most brides’ toes curl in terror, but wind never really gets a mention although if you live in the Cape, you know it’s a fact of life sometimes. So when I was looking at the images of Chanel and Rikus’ wedding – these beautiful portraits made even more beautiful by the fact that some are a little wild and windswept, I was wondering to myself if it had bothered them, or if they’d realised how much extra movement it would add to Migneon Marais’ of Pritti‘s gorgeous pictures of their big day. Then I read their story, and discovered that the wind is their talisman – a literal force of nature that brought them together and showed up to surround them with love as they exchanged their vows. That’s magical, isn’t it? And looking at these two, you can see that their love is something natural and unstoppable too. The romance! I’m totally neglecting to talk about the details here, but trust, they are awesome too – greenery done in a modern, minimalist way, and super fun touches like a blockbuster first dance, bridesmaids rocking contemporary Audrey Hepburn LBDs and updos, incredible catering from amazing SBB faves, Two Chefs, and a glow stick dance party. Let’s all get swept away, shall we? Wondering if an intimate wedding is for you? Well, look no further for inspiration. 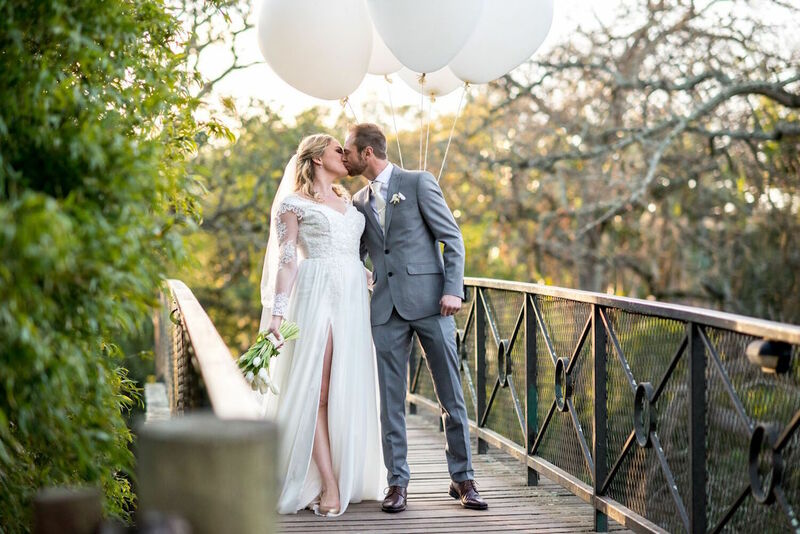 There’s a quiet sophistication we love about Melissa and William’s Stellenbosch celebration – a destination wedding at their favourite estate, Spier – it’s hard to believe it really only took two months to pull together! The white tulip bouquet, the beautiful blooms, the floral arch… The look is classic elegance, letting the couple’s love and happiness shine above all else, and the winter season and pared back guest list kept things intimate and cozy. 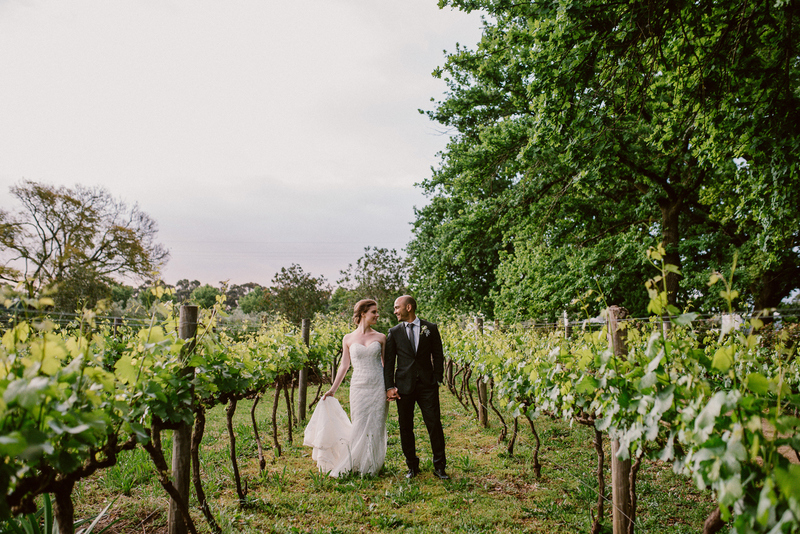 Love the way that the couple treated their guests to a wine tasting while they had their couple shoot – one of those experiences you can really maximise on creating for your guests when you have fewer of them. Helette Photography took these lovely pics! Show me a Wedding Concepts celebration, and I’ll show you one happy bridal blogger. And when that wedding happens to take a cozy autumn style and setting and turn it into a magical, elegantly lush celebration, I’ll show you one performing the dance of joy. Helande & Christian’s wedding was just that – a seasonal soiree given the WC touch, with opulent florals on the tables, clusters of Edison bulbs and fairy lights hanging from the ceiling, and most romantic of all, a candle-lit cellar ceremony. The palette is classic autumn jewel tones, given a modern twist, and I loved that the tables also included plump grapes and vintage brass platters and candle holders alongside the protea, orchid and hydrangea arrangements, which has the effect of an old masters still life. MvR Film captured these truly lovely images of a very special day! When I’m selecting weddings for publication, there’s always one detail that stands up and shouts at me, and I don’t mind saying that for one, it started with the bridesmaid dresses. They’re fabulous! Fun, frothy, Carrie Bradshaw-style tutus, and they are tutu cute! 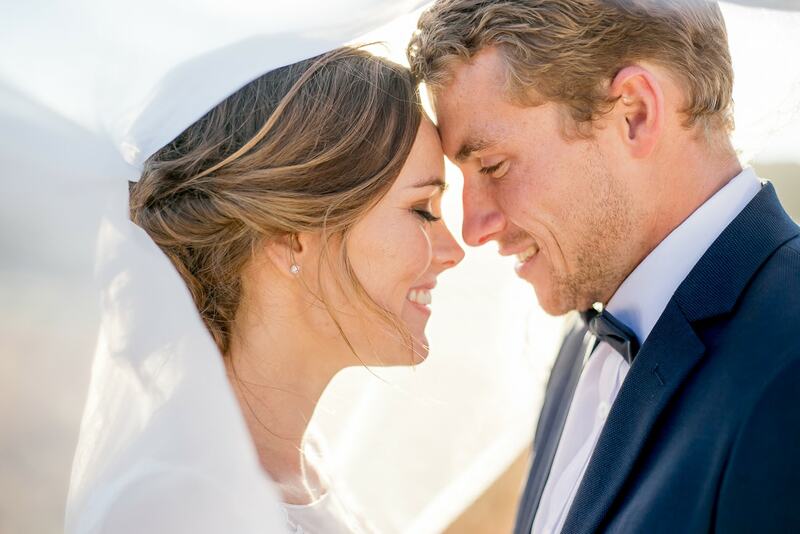 But the inspiration from Marike and Tobias’ beautiful day certainly doesn’t stop there. 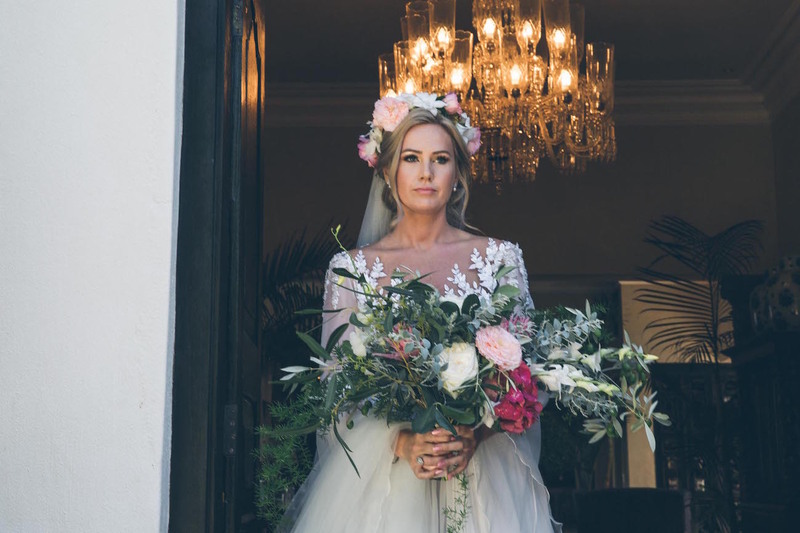 Combine a classic winelands setting with an eclectic collection of decor that’s vintage and glam and whimsical, with pops of bold, colourful blooms, and you might be getting close to describing what you’re about to see. And the reason I think it all works together is because it’s a true reflection of the bride and groom, so the decor and details are really an expression of their love and happiness. Claire Thomson was the perfect person to capture it all in these absolutely lovely images! 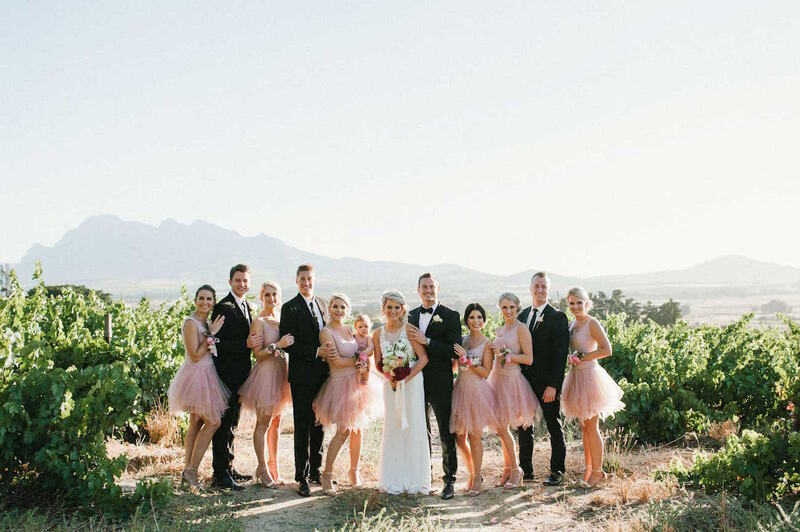 Take two fun-loving sweethearts who met in London town, add a palette of pinks and a pop of modern copper geometric details, serve it all up in the contemporary-meets-vineyard surroundings of Waterkloof, and… well. The results are every bit as fabulous as that sounds! 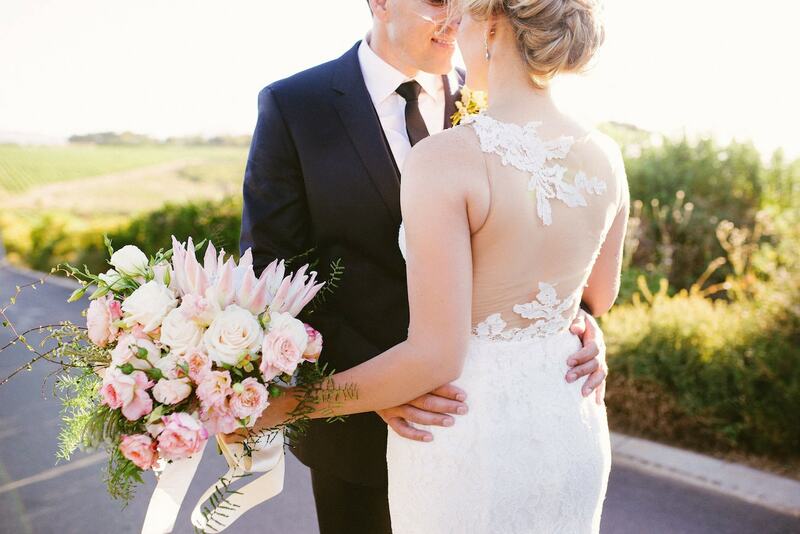 Paul and Catherine have that lovely combination of being a couple who are thoroughly relaxed about details, but have loads of lovely ones to show off, from a spectacular protea bouquet to one of the most darling mismatched bridesmaid lineups I ever did see. And that’s probably thanks to the talents of the lovely Theresa of Creation Events, who styled and planned the event to perfection, joining a team of talented pros that included the awesome Cheryl McEwan and hair and makeup stylista supreme, Ida Webster. You know, I might have been doing this wedding blogging gig for a while (and thousands of brides might have stopped in for inspiration along their journey) but I still get such a thrill when a bride tells me that SBB has been a big part of her planning experience from day one. 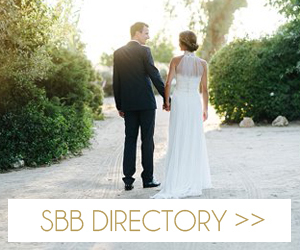 And when the end result is as heart-stoppingly GORGEOUS as Sandrine & Sam’s wedding? Well, that’s one giant compliment! Everything about this celebration makes my heart sing, not least the reception in the midst of the Molenvliet vines, the incredibly lush florals, and hello – Sandrine’s incredible wedding gown! Serious. Wow. Factor. The couple, together with their superstar planner, Cara of Mosaic Weddings, took A Midsummer Night’s Dream as their inspiration and translated it into a day that manages to be romantic and elegant and utterly magical, with fairy lights everywhere and personal touches, and peeks of floral print complementing those beautiful blooms. Basically, perfection. Shanna Jones took these wonderful pics! 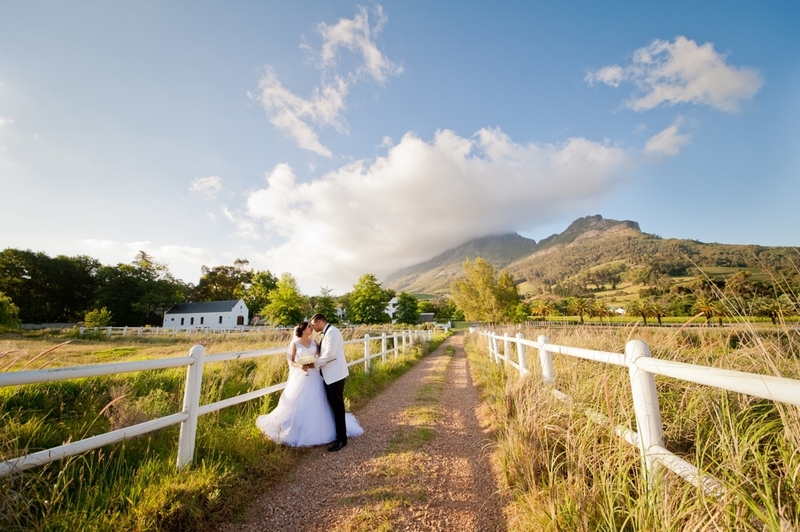 As an Oud Matie, I may be a little biased, but Stellenbosch weddings, especially those that embrace the incredible feeling of the outdoors there, have such a huge amount of charm about them that it’s impossible not to fall well and truly, head over heels in love with them. 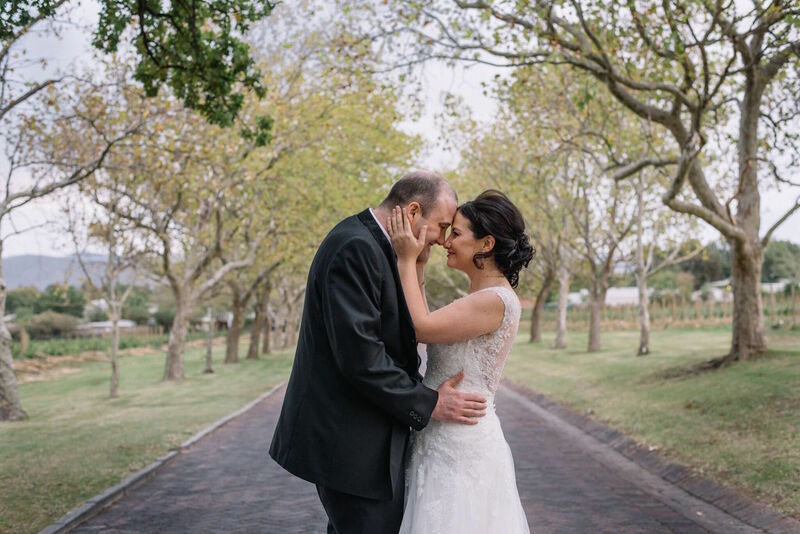 Today’s wedding has gorgeousness at every turn, starting with the couple themselves – Carli and Jean-Pierre looked like models as they breezed their way through their al fresco event, from their heartfelt indoor ceremony to their reception in the Nooitgedacht lane, a kind of natural courtyard surrounded by trees, with sun falling in dappled patterns through the branches and tables overflowing with greenery and soft white blooms. SIGH. I love everything about this celebration, not least the lovely pics by Alicia S., which really capture both the beauty and the emotion of this special day. 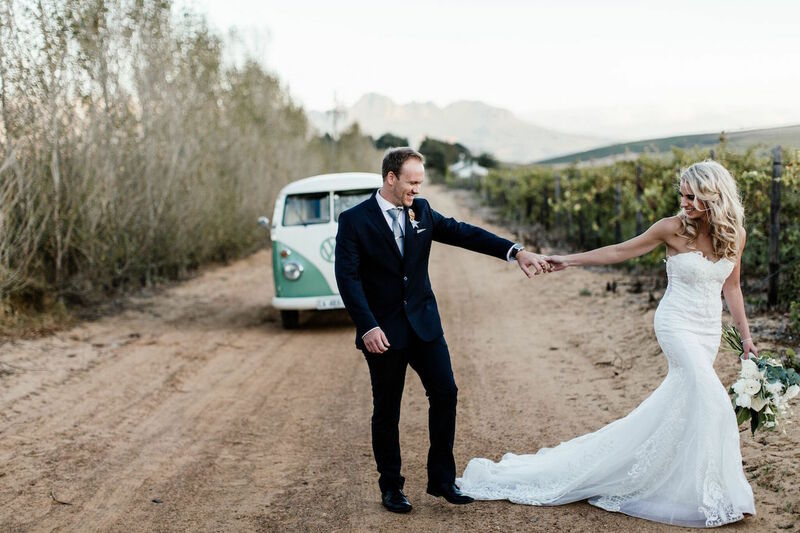 When I say that this wedding had me at proteas, I know that will surprise exactly zero of you, since South Africa’s national bloom makes regular (gorgeous!) appearances here on SBB. But it’s really a cocktail of ingredients that makes Fatima and Dane’s winelands wedding such a beauty. 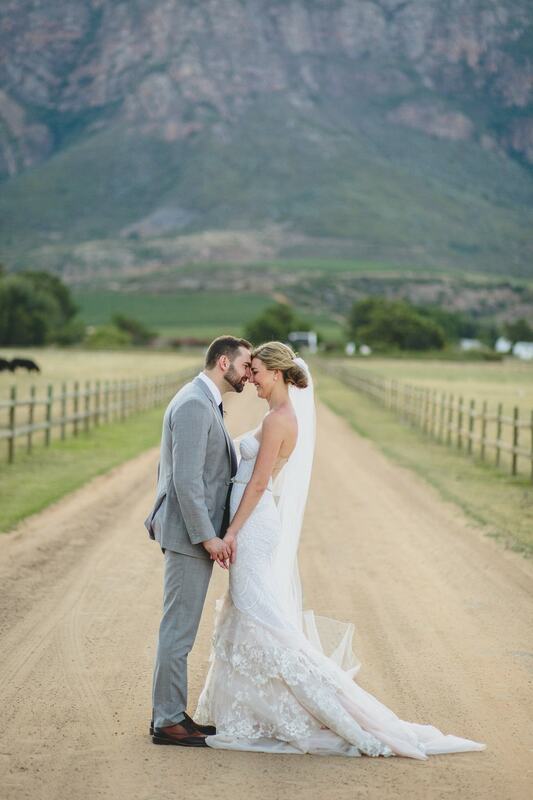 A dash of vineyard scenery (Vrede en Lust, which never disappoints), a tot of elegant style (thanks to Fatima’s breathtaking Pronovias gown and heirloom veil), a slice of rustic pretty (including the twelve-metre protea runner! ), all shaken and stirred together with some unpredictable Cape weather (no worries, there’s a rainbow at the end of this rainstorm) and you have a fete that exudes old fashioned romance right down to the sparkler exit. And with Lad & Lass behind the camera, you know the pictures will be just as wonderful!